Well, I went ahead and went to the midnight showing with a bunch of friends (with a little prodding from my cute husband whom I really don't think wanted me to drag him to it the next day). Yes, I'm glad I did. It was very fun hanging out with crazy people, (hee hee), eating Nibs, and listening to all the gasps and laughs throughout the movie. You just don't get that at a 7:00 showing on Saturday night! I felt just like a teenager again. It was great. As far as the movie goes.... it wasn't my favorite. Actually, I was very disappointed. I knew in my mind that nothing would compare to the book, but did it have to be so cheesy? I felt like they slapped it together as fast as they could, not realizing that if they put a little more into it, it could be a great movie! The characters weren't built up half as much as they should have been, and the music wasn't anything great (the music can make or break a movie). I guess I had too great of expectations. 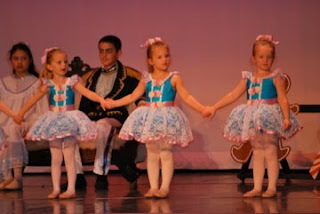 Saturday was the long awaited Nutcracker performance for my Ashtyn and her friend Marielle. 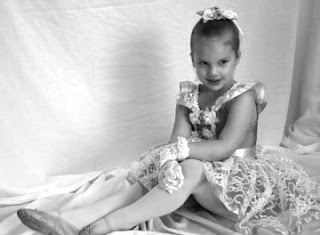 Ashtyn started ballet a couple of months ago and has loved it! She begged me for ages to put her in, and I'm so glad I finally did because it has been what she looks forward to all week. It helps that she has her good friend in there with her. 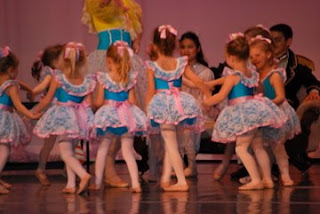 So, every Fall the ballet studio does a performance, the Nutcracker. The girls were so excited to do it and so I couldn't resist, but the down side is that they have to practice on every Friday night for about two months! It's so, so over crowded in the small room with all the families and they only practice for twenty minutes, but it takes so much of your Friday night. Ashtyn stepped in doggie doo doo right before the Suttons picked her up. As we tried to clean up, she broke out in hysterics and wouldn't calm down. 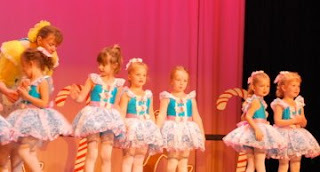 Ashtyn waited in the back with friends for their turn in the performance. 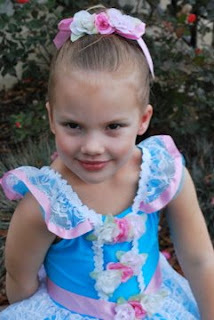 Did her part in the first Nutcracker for all of five minutes very well! Broke out in hives all over body with little red boils. Had Bennadryl for the first time and was a little hyper. For second performance (yes, it was a long day for those little kids!) wouldn't let mom out of sight for part of it, and for the other part, I spent chasing her around backstage. Finally let me out of sight so I could take pictures of performance. 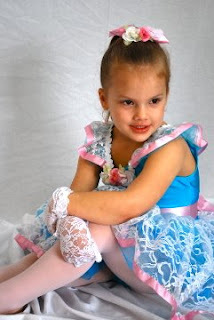 Did great in her performance!! Ran around again (what does this Bennadryl have in it?) while Brian and I chased her around the theater. 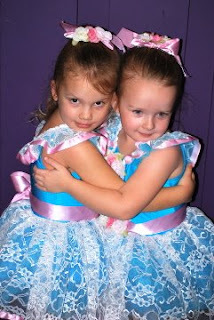 Finally Ashtyn and Marielle dressed and we headed for home. Much whining and crying on the way home. Ashtyn finally zonked out on the way home. Yes, it was a pretty eventful day and so emotionally draining. And I thought it was going to be so nice to sit in the audience and get to watch the performance. Hmm... oh well. The good news is when she finally woke up and felt a little better, she was asking when she gets to do it again. That made me laugh after all the trauma we had. And in case your wondering, the red, bumpy rash got much worse the next day and looked like little boils all over her body. It didn't hurt her though, but was very itchy. Then Monday morning it disappeared. We are thinking hives, any ideas? Yesterday was the first time I have ever sat and watched my children during our ward's sacrament meeting program in the congregation. For the past six years I have been in a primary calling so I haven't gotten to just sit back and take it in. Well, not only was it great to be sitting next to my husband during the program (yes, usually we are about five feet apart with four kids in the middle of us), but I just couldn't help the emotions come out when all of those sweet kids were singing their hearts out. Wow, the spirit was so strong as all of those kids bore their testimonies. 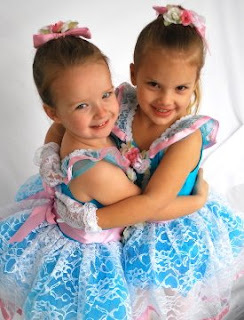 Yes, my kids did all their parts just great, and that was awesome, but the best part about it is that they loved it. They practiced for days the songs as we would drive in the car (with no prodding from me) and as I watched them sing yesterday, I knew that they were bearing their testimonies. I knew that they felt the spirit and that they love the Savior. What is more important than that? So, today I am grateful for the primary program. For those great teachers and leaders who teach my kids and help them feel the spirit on a continual basis. Thank you thank you, for loving them and helping them someday to return to their Heavenly Father. Okay, it's about time that I write about Halloween since I am starting to hear Christmas music. 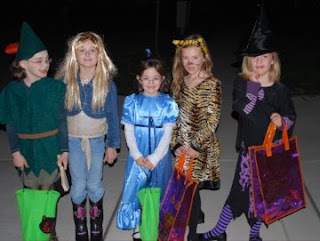 So here you go... Tera was a tiger, Shay a witch, Ashtyn a fairy princess (just like last year), and Raegan a purple dragon (I used this for Ashty a few years ago). 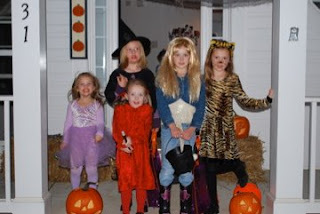 So, as the Halloween years have passed I notice that I stress less and less about what my kids are going to be. This year I was thrilled when Ashtyn said she wanted to be what she was last year. 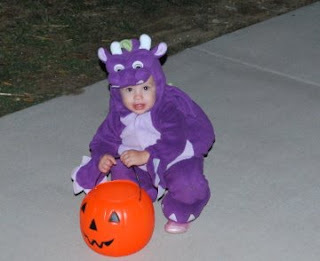 I was also so excited to find that Raegy fit into our little dragon costume that we had. Shay wanted to be a witch, so I went to Salvation Army, found a black shirt and skirt, did a a little cutting and there you have it! Tera wanted to be a tiger, so I did buy hers. Yes, it kills me to spend a ton of money on costumes and because I'm not quite the sewer that my mom would like me to be (love you mom!) I decided I better start thinking about next year now. I am pretty darn good with a hot glue gun and I'm excellent at finding sales (especially at Salvation Army). So, we will see. Trick or treating this year was great. Two reasons: 1. We went with some good friends (Suttons and Walburgers) 2. 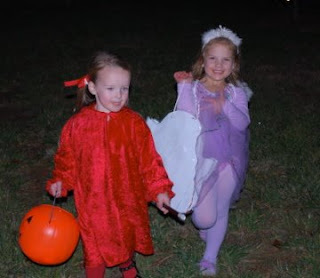 We went to single family houses rather than town houses so our kids got lots of exercise, but not a ton of candy. 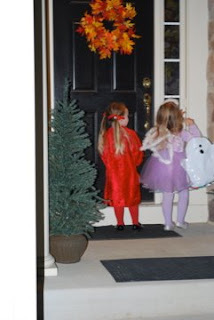 My favorite part of it this year was watching Ashtyn and Marielle go from house to house. Ashtyn running as fast as she could (there was candy to get!) and Marielle begging Ashtyn to slow down. Then, when they finally got to each door, Ashtyn would ring the doorbell and Marielle would use her little witch stick and give it a few wacks. They had it down. I know I shouldn't have let her wack the doors, but oh it was too funny, I couldn't stop it.